Actually it does work. Even though when I first launched the app and I clicked "Yes" to allow push notifications, by default the "Stay Online" feature is disabled / off. Very intuitive eh? Anyway, I had to click 'Settings', then 'Stay Online', and then pick 5, 15, or 30 minutes. Bummer that it's not 24 hours. 30 minutes is way too small. I recall some other push apps limited to 30 minutes. I wonder if this is a Steve Jobs imposed limitation? Still, it's nice to be able to receive IMs from Skype, Windows Live, Yahoo!, AIM, and more while Nimbuzz is closed and I'm running other apps (up to 30 minutes). It also sports Facebook as well. Going to add that in now and test it. Looks like Facebook IMs work as well. Pretty sweet! My only complaint now is that I have to scroll through hundreds of Facebook friends, Skype buddies, etc. with no 'search' feature. Would be nice to Just type letters and it auto-matches as you type. (Weird, I didn't see the Search field before but it's there. Was late when I blogged this ~12:45am). I'd also like to see generic SIP support like truphone so I can add in any SIP credentials. This way I can configure it with my corporate IP-PBX. 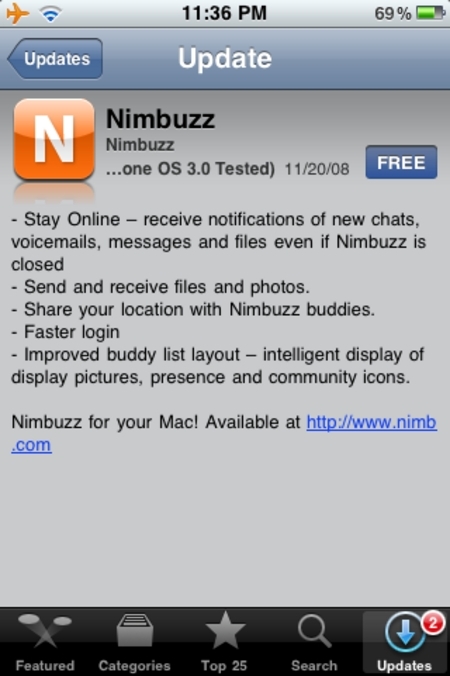 Looks like Nimbuzz also launched a Mac client too! Boy, they've been busy! FreedomPop for iPod Touch - Free 4G Internet Coming! Actually it does work. Even though when I first launched the app and I clicked \"Yes\" to allow push notifications, by default the \"Stay Online\" feature is disabled / off. Very intuitive eh? Anyway, I had to click 'Settings', then 'Stay Online', and then pick 5, 15, or 30 minutes. Bummer that it's not 24 hours. 30 minutes is way too small. I recall some other push apps limited to 30 minutes. I wonder if this is a Steve Jobs imposed limitation?